The "T" stands for Triplet and an air-spaced triplet design is exactly what you'll get. Inside the precision crafted lens cell, you'll find three elements, two extreme quality crown and flint glass, with an FPL-53 Extra-low Dispersion glass element sandwiched in between. While traditional refractor designs use oil in between elements, Takahashi doesn't... that means no oil to possibly leak out or become opaque with age. The "SA" stand for "Super Apochromat" and Apochromatic means you're free from those strange violet glows which often accompany bright stars or planets.The lens cells are durably constructed to withstand transport - yet are fully able to be collimated should the owner wish to make adjustments. With 1/12th wave accuracy and an airy-disc Strehl ratio of 0.992, the optics on the Takahashi TSA-102S are as near to perfection as you can get! The color free images produced will delight the lunar, planetary and deep sky observer with very high contract images with pin point stars. Do you need portability and flexibility? That's what this Takahashi telescope was designed for. The compact size, less than 23� with the lens shade retracted, makes the Takahashi TSA-102 refractor telescope the perfect airline-ready apochromat. , it's easily stowed in an overhead compartment and its light weight (11 lbs.) means it isn't a pain to carry. Being small and lightweight means the Takahashi TSA-102S is very versatile, and can be combined with a great number of high quality, lightweight mounts and tripods to equip you with exquisite optics on the go! 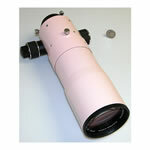 You'll appreciate the diffraction-free viewing that delivers up rich colors in binary stars, well resolved globular clusters and crisp lunar and planetary images..
Not only is the Tak TSA-102S a great visual instrument, it can be converted into a flat field f/7.84 or an f/5.98 wide field imaging platform for a CCD camera or digital SLR camera. The addition of the optional camera angle adjuster allows the image to be rotated 360� without loss of focus. The camera angle adjuster is also very handy for visual applications to position the eyepiece or bino-viewer in the best, most comfortable position. 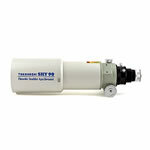 For even more flexibility from your Takahashi TSA-102 refractor telescope, add an optional field flattener when using it for astrophotography applications. 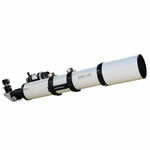 This will change the focal ratio to f/7.84 and provide you with a 42mm image circle and 3� field. Or how about an optional focal reducer? 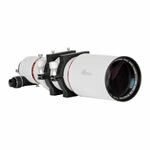 This changes the focal length to 610mm and the focal ratio to f/5.98 - providing the astrophotographer with a 53mm image circle and 5� field. We're talking pinpoint stars right out to the edges and absolutely unvignetted images! 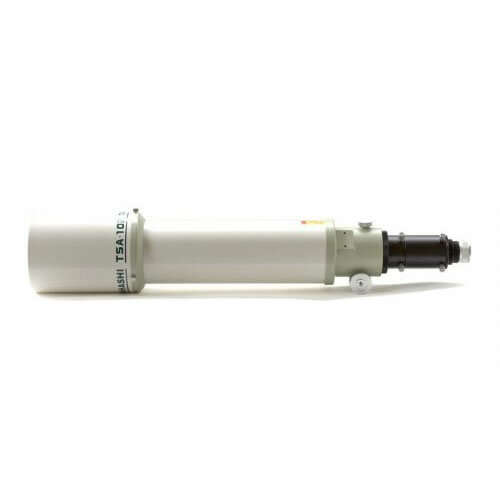 For even more options, you can also add a variety of camera adapters to the Takahashi TSA-102 refractor telescope and even work with eyepiece projection, planet cams and solar filters. Ortho-Apochromatic Triplet Lens incorporates an FPL-53 Extra-low Dispersion glass element sandwiched between crown glass to eliminate chromatic aberration. 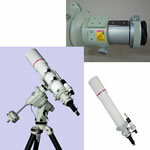 The Takahashi TSA-102S APO Refractor Telescope provides 816mm focal length at f/8 and can provide up to a 3.06� field at 16X. Superior light transmission and excellent contrast - all surfaces are fully anti- reflection multi-coated and the tube interior is knife-edge baffled. The Takahashi TSA-102S APO Refractor Telescope 2.7" rack and pinion focuser features 230mm of backfocus, dual knobs and optional 360� camera angle adjuster. Resolution of 1.14 arc seconds and limiting visual magnitude of 12.5. 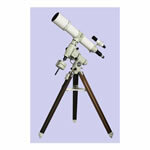 The Takahashi TSA-102S APO Refractor Telescopeis airline portable - less than 23� long and weighs 11 lbs. 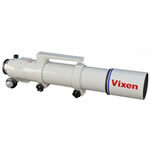 2.7� focuser for stable focusing, will accommodate heavy CCD cameras or bino-viewers. Very high color correction, produces color-free images. 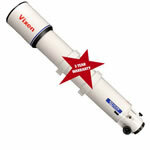 Enhanced back focus of 230mm [9.39�] allows the use of any bino-viewer with ease. Supplied with rigid 72mm r extension tubes to assure deflection �free focusing. Quick release finder bracket allows the user to keep finder alignment when finder is removed and reattached. Knife edge baffles and over sized tube produce very high contrast images.